Thanks for getting the gunk out of my eyes! 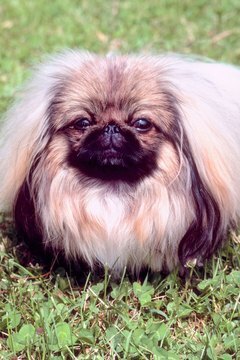 As adorable as your Peke is, he could pay a price for his short, cute head shape. That's because the Pekingese, along with bulldogs, pugs and canines with similar noggins, could suffer from brachycephalic ocular syndrome. That's a formal term describing a tendency toward eye problems in short-nosed dogs. While brachycephaly, which translates as "short head," is found in various dog breeds and even Persian cats, the Pekingese might be the most extreme example, according to the Universities Federation of Animal Welfare. The UFAW notes that the dog's prominent eyes combine with "an almost complete lack of muzzle." That lack contributes to brachycephalic ocular syndrome, which manifests itself in various ways. You're probably better off taking your Peke to a veterinary ophthalmologist for eye treatment, rather than relying on your regular vet who probably doesn't specialize in either eye problems or ailments specific to Pekes. Any discharge from his eye should be investigated by the veterinary ophthalmologist. An eyelid inflammation, blepharitis often affects the brachycephalic breeds, with the Peke at particular risk because his eyes bulge more than others. He might have a discharge from one or both eyes, either clear or mucous. He'll likely rub at them. That can lead to a secondary infection, making matters worse. The eyelid skin might turn crusty or look as if acne's broken out on it. If your Peke's eyelids turn inward, a common cause of blepharitis, surgery can correct the defect. Otherwise, your vet treats any bacterial infection with topical antibiotics, but the actual blepharitis treatment depends on the cause. You'll notice if your Peke suffers from entropion before he reaches his first birthday. In this hereditary disorder, the eyelid rolls inward, with the lashes irritating the cornea and causing excessive tearing, squinting and a heavy eye discharge. Your little guy's in obvious pain. He'll need surgery to correct the entropion. Without it, he could lose his vision due to cornea damage. You might have gone through a bout of conjunctivitis, or pinkeye, yourself. It's an inflammation of the conjunctiva, the eye's mucous membrane, and it's the most common eye disease affecting canines. Symptoms include redness, swelling, itching and a discharge. While a clear discharge usually means no infection, that's not the case if your Peke has pus. Topical antibiotics generally cure it. Chronic dry eye, or keratoconjunctivitis sicca, also affects Pekes. It's caused by lack of moisture in the eye, and symptoms include a very thick discharge. His eyes could ulcerate. He'll need frequent eyedrops to substitute for tears, along with topical anti-inflammatories. If his eyes ulcerate, he'll need surgical repair. Are Blue-Eyed White Cats Really Deaf?